(2) 5 lb. bags per case; 250-350 count per lb. Add delicious seafood to your menu with this Sea Snack 5 lb. bag of frozen cooked shrimp! These bite-size shrimp are packed with protein and are perfect for adding volume and flavor to nearly any dish on your menu. Since this shrimp is pre-peeled and pre-cooked, it can help you save valuable prep time and get meals out to your guests faster! You can steam the shrimp to thaw it out or toss it in a frying pan with butter to bring the shrimp to an internal temperature of 145 degrees Fahrenheit. Once it's thawed, this shrimp is a great addition to any part of your menu! To craft delicious appetizers, consider using this shrimp to create a warm, creamy garlic shrimp dip or a classic shrimp ceviche. Shrimp pairs well pasta, rice, quinoa, and other grains; try using it to craft a signature shrimp alfredo or a delicious shrimp risotto, both of which pair well with a fruity, spicy white wine! It's also a great way to add protein to your signature salads, or even create a mayonnaise-based shrimp salad. A great alternative to red meat or poultry, seafood entrees help expand your menu offerings! With 5 lb. of shrimp per bag, you are sure to be in good supply during peak hours. They are shipped cooked and IQF (individually quick frozen) to best preserve their freshness, as well as to prevent large ice crystals, or blocks, from forming. They are fully cooked, allowing you to simply thaw and serve. Not only are these shrimp convenient, versatile, and delicious, they are rich in protein and key nutrients, as well as low in calories. For a versatile menu item that adds nutritional value to any meal, stock your kitchen with these shrimp! 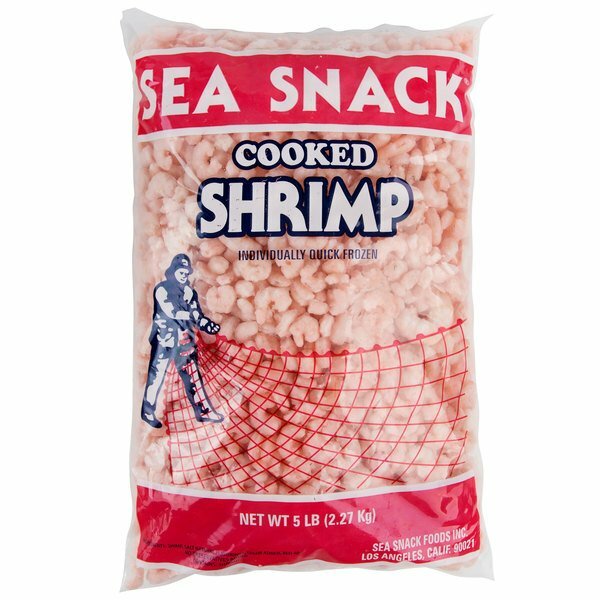 Sea Snack Foods Inc. was founded in 1954 by Arthur Pearlstein and it is still owned and operated by the same family today. The company was originally known for glass jars of shrimp cocktail. Over the years, Sea Snack has expanded its reach to supermarkets, hotels, and casinos in Las Vegas. With superior quality and innovation at the forefront of the company, Sea Snack is dedicated to providing customers with delicious shrimp to serve the needs of the foodservice industry!